I must admit that I don’t know a lot about Marilyn Manson the person or Marilyn Manson the band. However, I recently discovered that Marilyn Manson the person is an artist. Even more interesting is that this past Halloween night he opened an art gallery in Hollywood devoted to his artwork. The gallery is called “The Celebritarian Corporation Gallery Of Fine Art”. According to his website, the current exhibit is “selected works by Marilyn Manson” and future exhibits will include “additional works by Marilyn Manson and other celebrated artists and collaborators”. The gallery is open by invitation or appointment only. 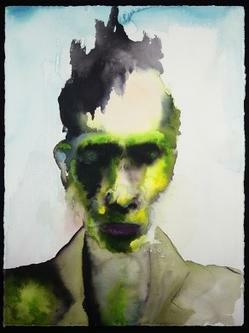 Marilyn Manson is a watercolor painter. His paintings are consistent with what you would probably expect based on his personal image. Most have what I would describe as an eerie deathlike quality, and there are some sexually explicit and violent images. For more information about Marilyn Manson and his artwork, visit the Official Marilyn Manson Website. See page 2 of the Pop Life Art celebrity artists list for more links to the artwork of Marilyn Manson and other celebrity artists.